The MINI-PLS, models M1250 is the fastest and most versatile PLS family in the market. We call it Mini because of the small compact size, but it is big in performance. In fact, the MINI-PLS is three controls in one: Programmable Limit Switch, Tachometer, and Motion Detector. The powerful microprocessor and the revolutionary design make the MINI-PLS an extremely compact, fast and versatile solid-state replacement of electromechanical cam switches. The high accuracy, reliability, operating speed and convenience of operation assure greater efficiencies in manufacturing, helping to increase production and reduce cost. 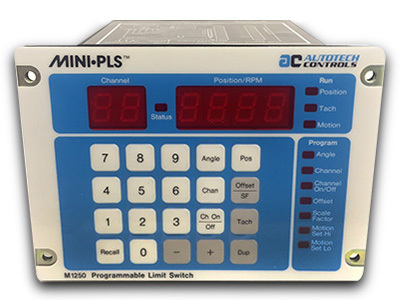 The MINI-PLS consists of two parts, one being a position transducer mounted on the machine and the other a programmable unit mounted in the machine control panel. The position transducer in this case can be a resolver or an ultrasonic linear transducer, which produces a rotary or linear position signal. This position signal is converted to digital format in the programmable unit, displayed on the front panel and compared to the dwell setpoints programmed into the PLS. When process cycle reaches these setpoints, outputs are enabled or disabled, starting or stopping desired functions during the cycle. The resolver as well as the ultrasonic linear transducer provide absolute positioning, that is, the MINI-PLS always gives TRUE position even upon machine movement after power outage. Further, a programmable scale factor up to 4,095 (resolution of 4,096 per turn) is provided to meet the required system resolution or for direct readout in engineering units. For linear transducer systems the resolution is predefined as 1,000 counts-per-inch. The MINI-PLS is fully front panel programmable with convenient tactile keyboard and yet secure against any unauthorized program changes. Opening of an external user provided keyswitch inhibits any program changes on the front panel. The MINI-PLS combines the ruggedness of a brushless resolver or noncontacting ultrasonic linear transducer and the reliability of an advanced solid-state control. The rugged, heavy-duty NEMA 13 (IP54) single- or multi-turn resolver can be mounted on a machine in any hostile environment; such as mechanical shock, vibrations, extreme humidity and temperature changes, oil mists, coolants, solvents etc. The programmable control unit can be mounted up to 2500 feet (1000 feet for linear transducer) away in a control panel. The splash-proof oil-tight front plate permits the unit to be installed directly on the machine itself, if so required. The ratiometric converter assures high tracking speed of 1800 rpm and high noise immunity. Modular 40 Channels in 6.25" x 4.5" x 7.25" compact enclosure. The ultra-modern technology used by Autotech has made it possible to house 40 channels in such a small space saving enclosure. The system flexibility is further enhanced by the modular construction. The unit can be expanded up to 40 channels using five modules of eight channels each. A cam module with desired logic level or power outputs or a separate chassis with plug-in power relay outputs can be selected to match the application. Parallel BCD position and tach output modules can be inserted in slots 4 or 5. This modular concept also permits an easy adoption in field to the future technological developments by simply adding new modules to the same basic unit. The scale factor, offset, dwell, and motion detector setpoints are all stored in nonvolatile EEROM memory as they are entered by the user. The information is retained indefinitely after power loss or machine shutdown, eliminating need for back-up batteries and related hazards. The program setpoints are stored directly in the cam modules in nonvolatile EEROM memory. The information is retained without power, even when the modules are taken away from the MINI-PLS. This unique feature of program storage in the cam module permits programming of various modules for different jobs or spares, reducing downtime and eliminating eventual errors due to hurried reprogramming at job changes. Also, the cam modules can be programmed at a central place, such as corporate headquarters, and distributed to various plant locations. The plug-in cam modules are optically isolated and are available with TTL, PNP or NPN type of logic level outputs. The sub D connector style on these modules with preassembled cable assembly eliminates all field wiring and the related eventual wiring errors. Power cam modules are also available with AC (120 VAC @ I A) or DC (10-28 VDC @ I A) ratings. Optional electromechanical relays (10 A) and solid-state AC (3 A) or DC (3 A) relays are mounted on a separate chassis. All these relays are plug-in type for easy field replacement. The solid-state relays are optically isolated. Optional parallel BCD position and tach output modules with built-in PC-handshake as well as analog position/tach output modules are available for remote readouts or control devices. The model M1250 is the basic MINI-PLS, whereas all the above M1450 models are the advanced versions of the single­turn rotary PLS. The single turn MINI-PLS is an absolute position programmable limit switch that uses a resolver as input and has built-in tachometer and motion detector. The model M1250 offers an ultra fast response time of 57 µs. The M1450 Models offer rate offset (ROF) and dynamic zeroing (ModZ) as standard features. Serial communication RS­232C or RS-422A is provided on the model M1450-300. The model M1450-MROF features programmable multiple rate offsets (up to 19), while the model M1450-400 is a high resolution PLS (up to 4096 counts-per-revolution).